Please do not reupload any of the images/links in this mod as a separate mod on either the nexus or workshop. Thank you. 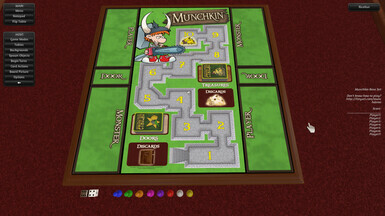 This Item HAS received a DMCA, which I assume means SJG doesn't want to see munchkin on either the nexus or workshop. 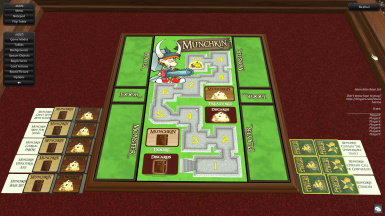 Feel free to vote for whichever munchkin expansion you would like next in the comments. They will be made in order of popularity of vote. One vote per person. 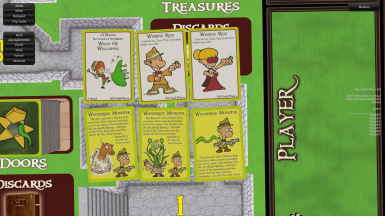 I noticed that there was another munchkin set however it was lower quality so this set was made. The base set is currently the only one done. More will be added. Stay tuned. So lots of new decks recently. That's thanks to QQuixotic as we've decided to merge mods. He's been a great help to me. All the new stuff added was thanks to him. Feel free to join my steam group if you need someone to play with at Tabletop Simulator Club. Just leave a comment and I'll add you to the group. This game was made by Steve Jackson Games, the illustrations were done by John Kovalic. I am in no way affiliated with the developers of this game. 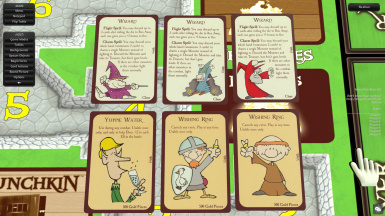 I do not claim to be the creator of any part of Munchkin. - QQuixotic For deciding to merge mods. Also being a great help to making this mod in general. - Bad for providing the scans to Apocalypse. - TRIBALien for providing a link to a lot of good source material that's already been scanned. Where %User% is your windows account name. If you can't find this folder create a save file in game and then the game will create the folder. To add a link to the game you must first load the custom game mode type and add the link in for the background. DO NOT USE the base deck that pops up for loading cards. You need to upload the images to your favourite image hosting site and then proceed on to the links section of installation. 02:46, 29 April 2014 - Added a new file that contains all the links. 02:53, 29 April 2014 - Added Redone Base Core, Unnatural Axe, Clerical Errors, Need For Steed, Cheat With Both Hands, and labels to the main save. 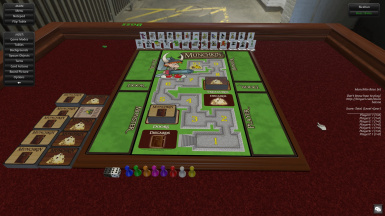 19:45, 29 April 2014 - Added Bites Core, Fairy Dust, Marked For Death, Monster Enhancers, Munchkinomicon, Reloaded, Star Munchkin Core, and Zombie Core to both links and images rar. 21:01, 29 April 2014 - Fixed an error on both the links and images .rar as the star munchkin door backs were accidently treasure backs instead. Thanks to Rogun for spotting it. 04:40, 1 May 2014 - Added Apocalypse to both the images and links .rar. Thanks to Bad for the scans. 14:06, 1 May 2014 - Fixed the apocalypse seals. Batch command missed 2 for whatever reason. Thanks to Bad for noticing it. 18:14, 1 May 2014 - Changed orientation of seals from the Apocalypse Set. Looks better this way. 20:07, 11 May 2014 - Corrected: Bites decks' backs, Added: Bites2, Super, Super2, Cardboard Heroes.